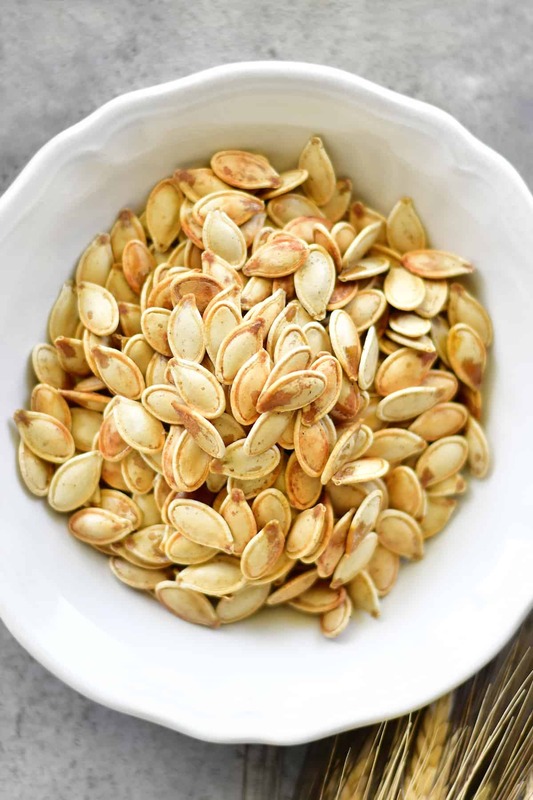 Seasoned Salt Roasted Pumpkin Seeds are simple, flavorful, and make the perfect fall snack! Save the pumpkin seeds and turn them into something delicious. My mom has been roasting pumpkin seeds my whole life. It was one of our favorite things about carving pumpkins in the fall. She usually made roasted pumpkin seeds with salt which are such a classic. But we like to take it a step further and used seasoned salt. Seasoned salt is a combination of spices including salt, sugar, paprika, turmeric, onion powder, garlic powder. You can buy already blended or make your own mix adding more or less of your favorite spices. Where is the recipe for seasoned salt roasted pumpkin seeds? 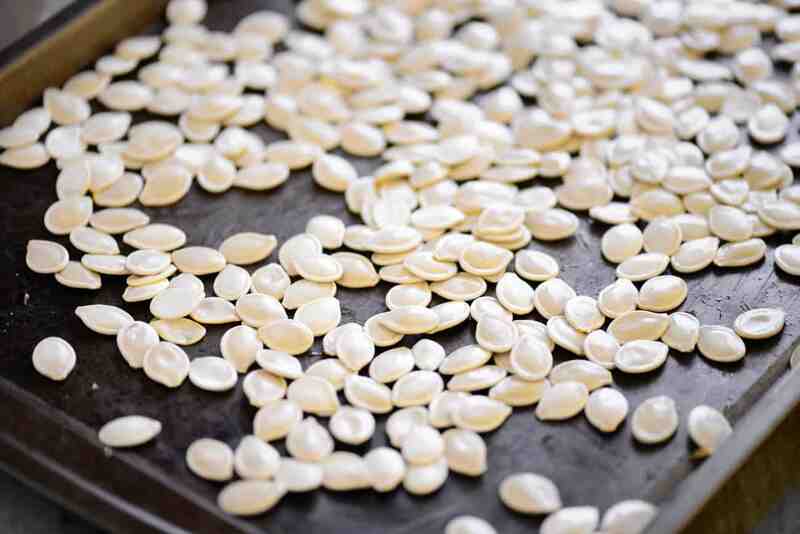 In this post, I will share step-by-step instructions with photos for making the pumpkin seeds, as well as answering FAQs about the recipe and showing a video of the recipe. But you can go directly to the recipe by scrolling down to the bottom of the post. This recipe calls for about 2 cups of pumpkin seeds but can be adjusted if you have more or less seeds. The perfect time to roast pumpkin seeds is after carving pumpkins for Halloween. Just ask everyone to set their seeds aside! 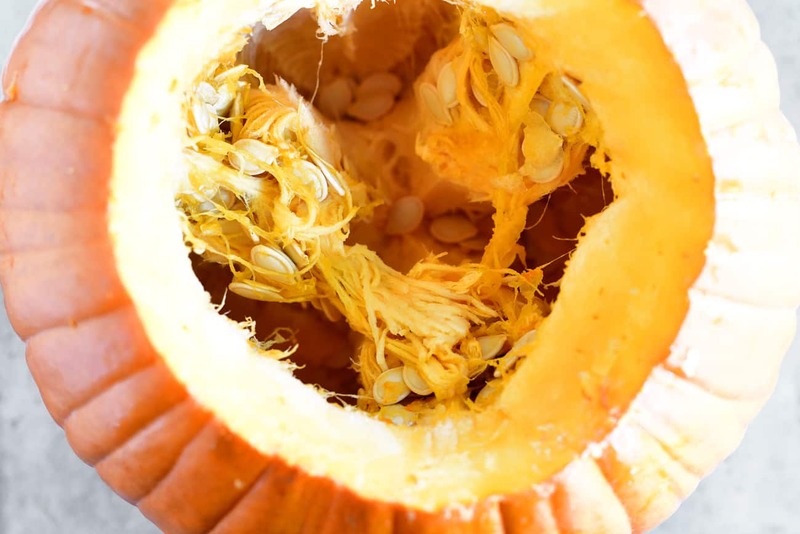 To get to the pumpkin seeds you’ll need to cut the top (or bottom) off of the pumpkin. We like using a serrated knife meant for cutting pumpkins in an up and down sawing motion. You can also use a sharp, serrated kitchen knife or even a SAWZALL like my brother-in-law does. Next comes the messy part. 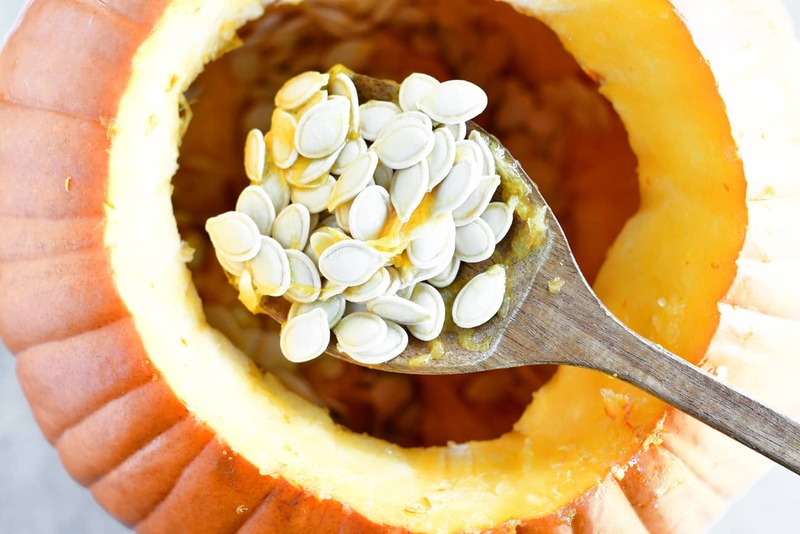 Use the flat edge of a sturdy spoon or spatula to scrape the pulp, fibrous strands and pumpkin seeds away from the pumpkin flesh. Try different kitchen utensils to see which one you like best. We’ve used everything from wooden spoons and stainless steel serving spoons to ice cream scoops and spatulas. Scoop out the pumpkin seeds and try to leave behind as much of the “pumpkin guts” as possible. 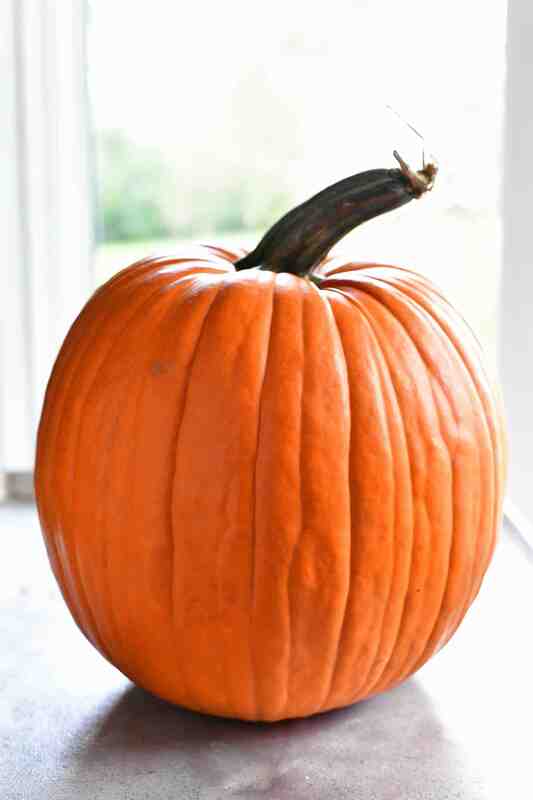 Or to carve the pumpkin into a jack-o-lantern, remove all of the “pumpkin guts” so that the inside is smooth and clean pumpkin flesh. 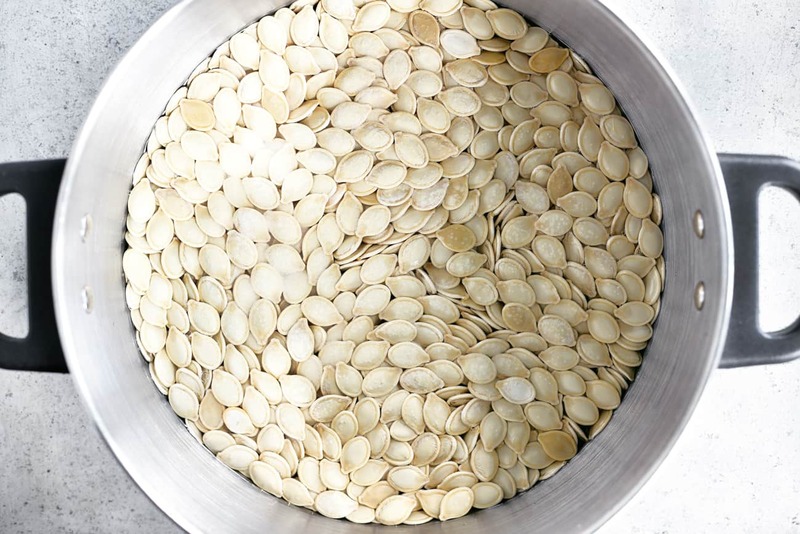 Spoon the pumpkin seeds, along with any bits of pulp sticking to them, in a large colander. Place the colander in an empty sink and rinse under running water. Use your fingers to separate the pulp and fibrous strands from the seeds. Discard everything but the seeds. Pour the clean pumpkin seeds into a large stockpot. Add water and salt. Bring to a boil over medium heat. Reduce heat and simmer for 10 minutes. Drain well. Note: You can skip this step or use an alternative method. See the FAQs below for more details. Pour the pumpkin seeds into a bowl and add the olive oil and seasoned salt. Stir until coated. Two cups of pumpkin seeds were used for this recipe. If you have more or less, you can add more or less of the olive oil and seasoned salt. Spread the pumpkin seeds out in a large rimmed baking sheet. Bake at 375˚F for 25-30 minutes, stirring and turning every 5 minutes, until golden and crunchy. 1. 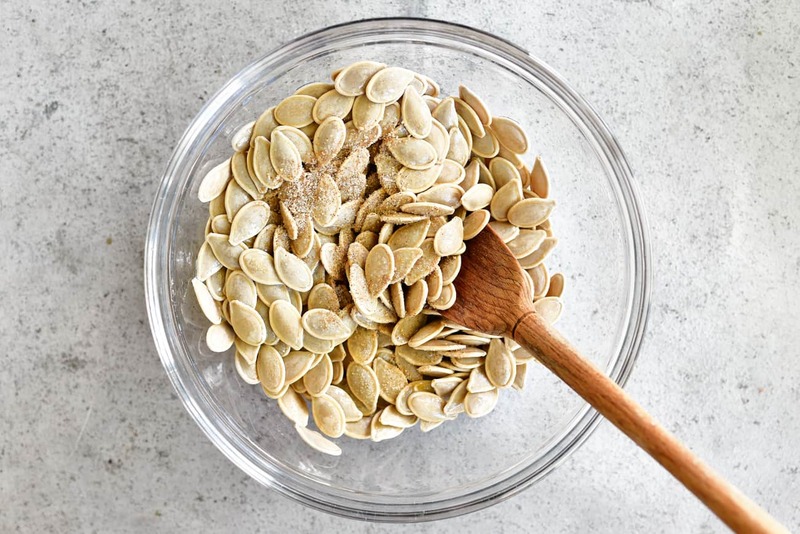 Why boil the pumpkin seeds prior to roasting? Boiling the pumpkin seeds will result in crunchier, more flavorful pumpkin seeds and helps to get some of the salt to the inside of the seed. 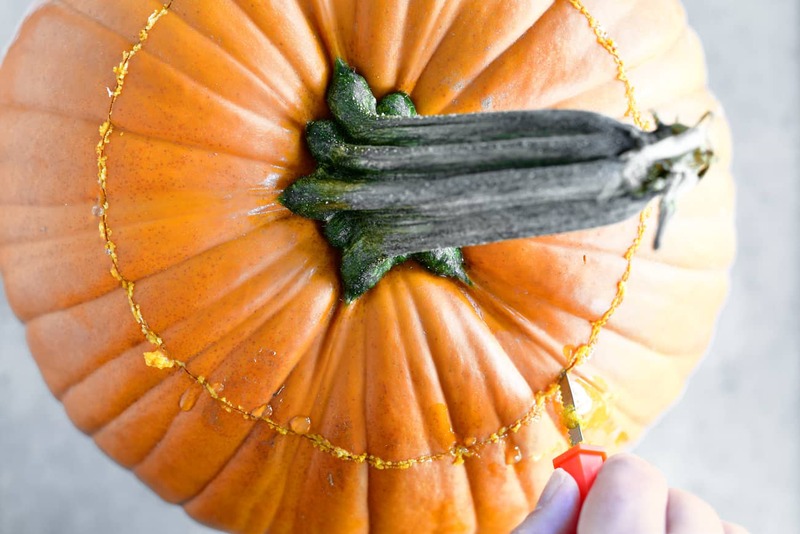 You can skip that step and go directly to coating the rinsed and drained pumpkin seeds with olive oil and garlic powder. 2. 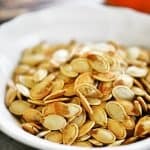 Can the pumpkin seeds be soaked in salt water overnight instead of boiling them? Yes, that is what my mom used to do. Pour the seeds into a large pot. Add water and salt. Soak in salt water overnight. Drain well before roasting. 3. 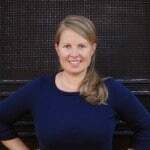 Do you have an alternative to using olive oil? Yes, you can use melted butter, vegetable oil, canola oil, or even coconut oil. 4. Can you make your own seasoned salt? Yes, here is my seasoned salt recipe: Combine 2 tbsp salt, 2 tsp sugar, 1/2 tsp garlic powder, 1/2 tsp onion powder, 1/2 tsp paprika, and 1/4 tsp turmeric. Add more or less of each spice to make it the way your family likes it. 5. Does this same method work with the seeds from other kinds of squash? Yes, but the cook time will vary since they are smaller seeds. Since you are stirring every five minutes during roasting, watch them carefully and remove when they are toasted. Want more pumpkin seeds recipes? We’ve got you covered! 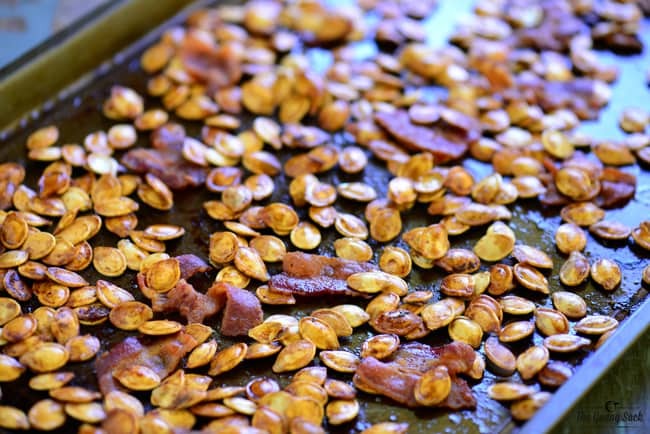 Bacon Roasted Pumpkin Seeds: This crave-worthy Bacon Roasted Pumpkin Seeds recipe makes the best toasted pumpkin seeds EVER! Everyone will love this easy snack or appetizer with bacon! Garlic Roasted Pumpkin Seeds: Make garlic roasted pumpkin seeds with all of the leftover seeds from carving jack-o-lanterns for Halloween. They are a delicious, nutritious snack! Sweet Pumpkin Seeds from Sugar Spun Run: Sweetened pumpkin seeds roasted on the stovetop and coated in pumpkin spice (or cinnamon) and sugar! Pumpkin Soup with Spicy Pumpkin Seeds from Williams-Sonoma: The best part about this recipe is that it uses almost the entire pumpkin, and the seeds from the pumpkin are roasted to use for the garnish. Ranch Roasted Pumpkin Seeds: Don’t throw out the pumpkin seeds. Save them to make Ranch Roasted Pumpkin Seeds. They are so good that they are hard to stop eating! Cut the top off of the pumpkin. Use the flat edge of a sturdy spoon or spatula to scrape the pumpkin seeds away from the pumpkin flesh. Scoop out the pumpkin seeds and try to leave behind as much of the pulp as possible. 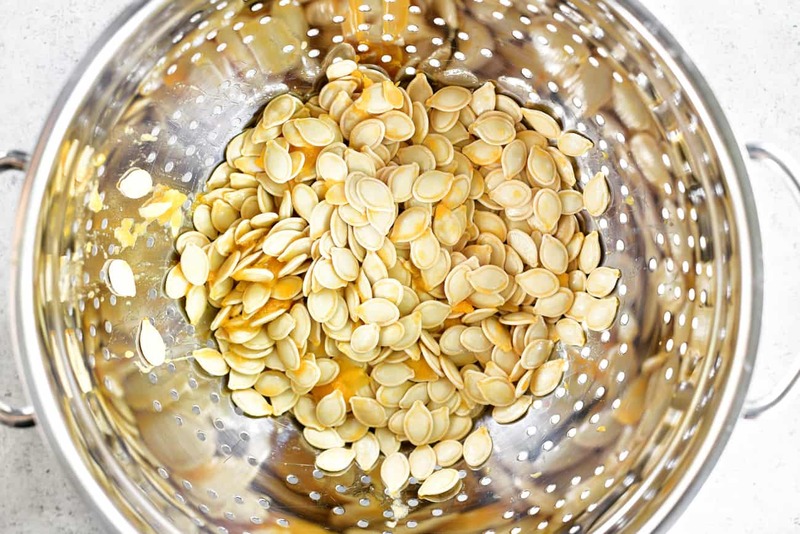 Spoon the pumpkin seeds in a large colander and rinse them under running water. Use your fingers to separate the pulp from the seeds and discard. Pour the clean pumpkin seeds into a large stockpot. Add water and salt. Bring to a boil over medium heat. Reduce heat and simmer for 10 minutes. Drain well. Pour the pumpkin seeds into a bowl. Add olive oil and seasoned salt. Stir to coat. 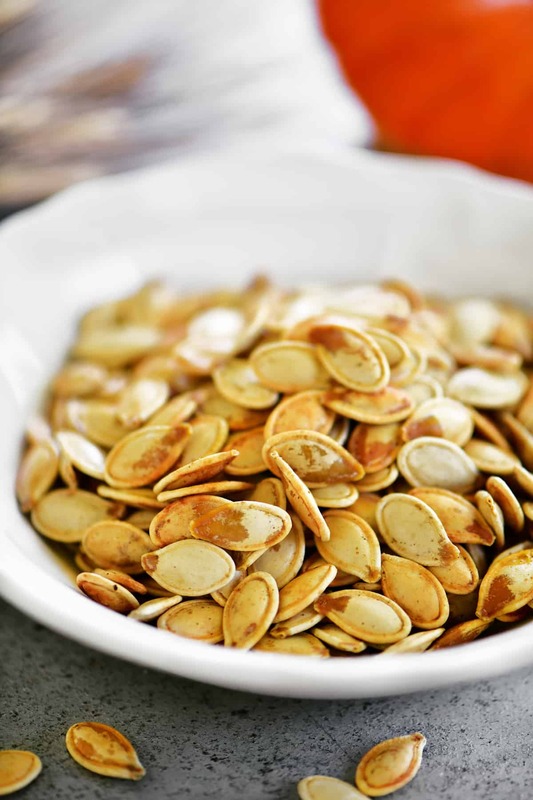 Spread the pumpkin seeds out in a large rimmed baking sheet. Bake at 375˚F for 25-30 minutes, stirring and turning every 5 minutes, until golden and crunchy.